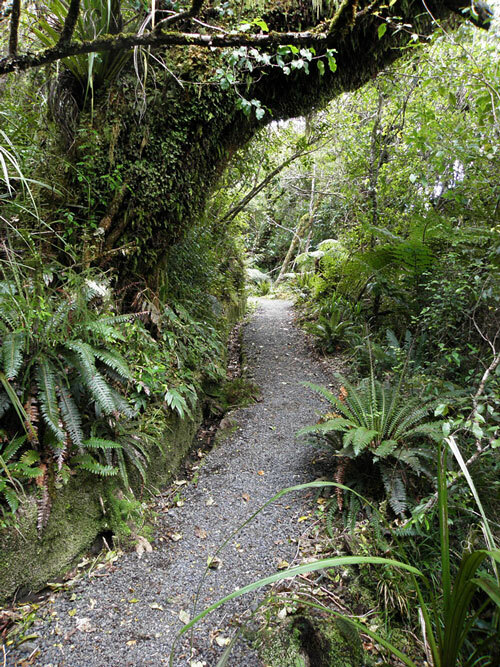 National Park Village borders the World Heritage Tongariro National Park to the east and the Whanganui National Park, to the West. 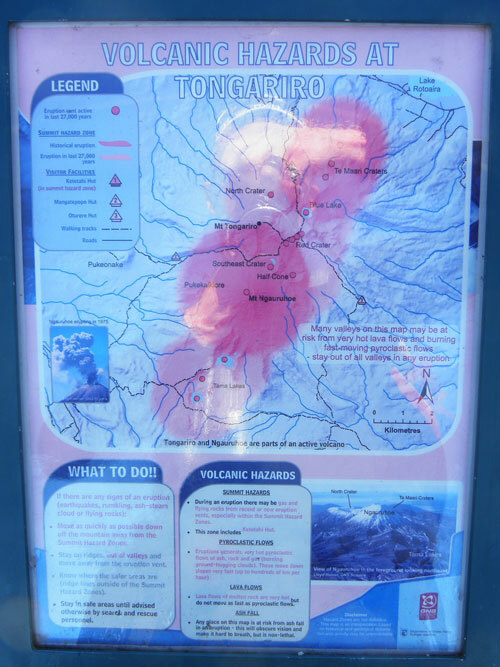 Tongariro was the fourth national park established in the world. 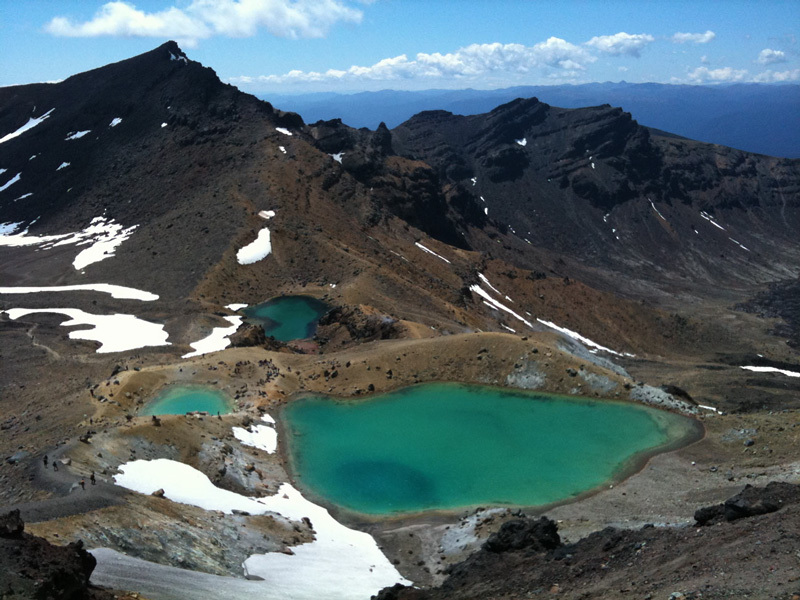 National Park Village is located near the base of Mt Ruapehu, on the volcanic plateau. 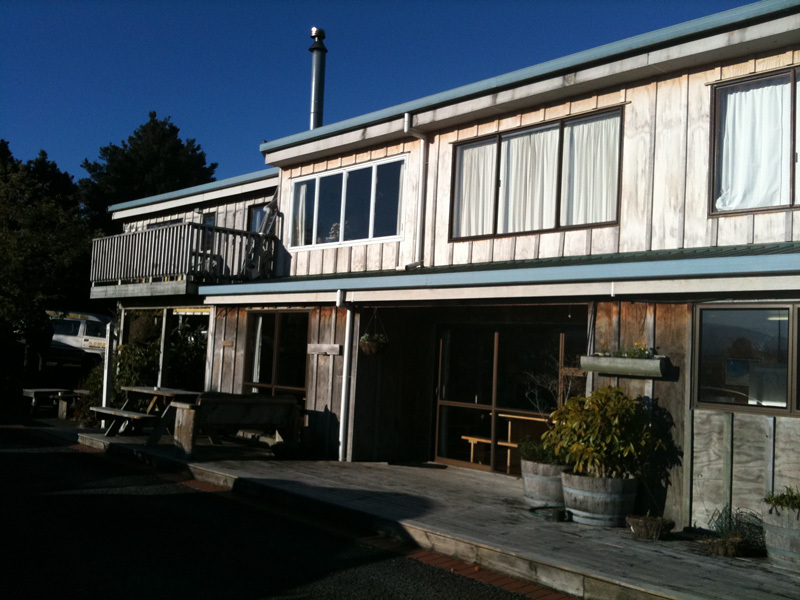 The village has great views of Mt Tongariro, Mt Ngauruhoe (Mt Doom in the Lord of the Rings movie) and Mt Ruapehu. 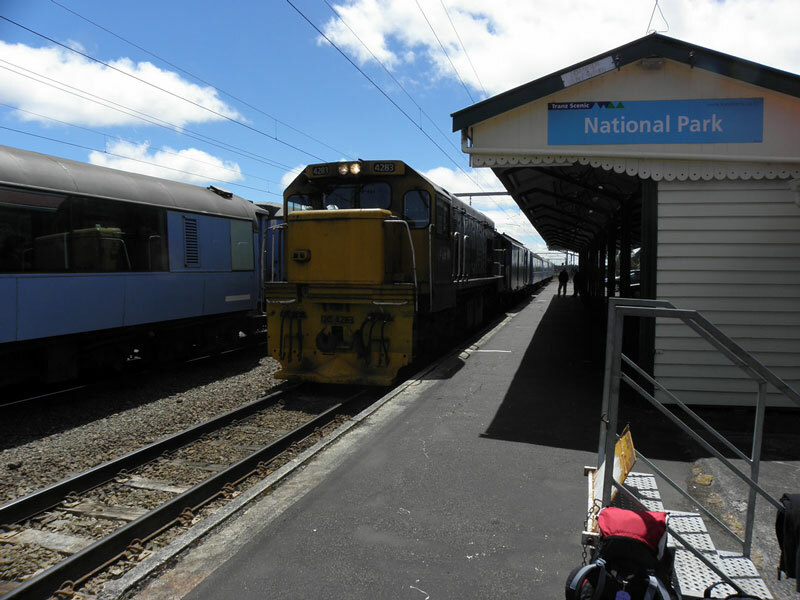 The Overlander train from Auckland to National Park took about six hours and the journey offered breathtaking views. 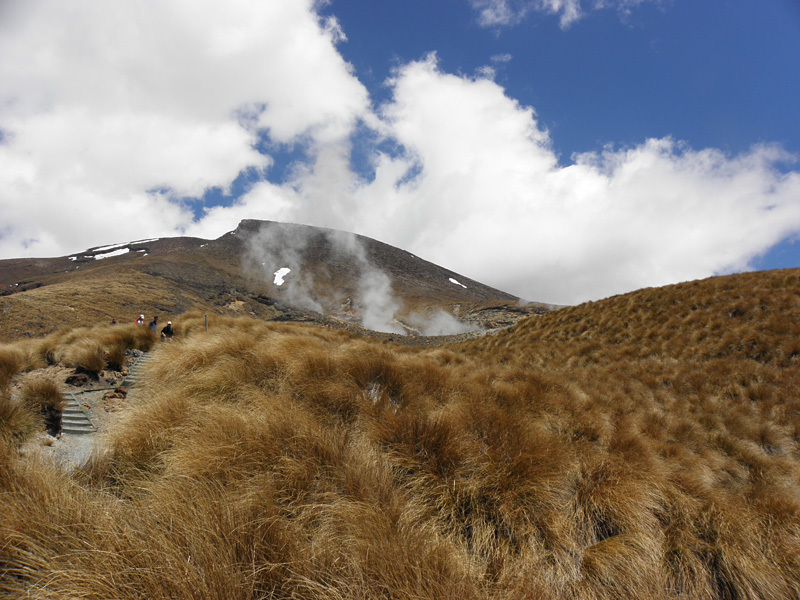 As it was at the beginning of the tourist season I was almost alone getting off at National Park, which the highest urban township in New Zealand at 825 metres. 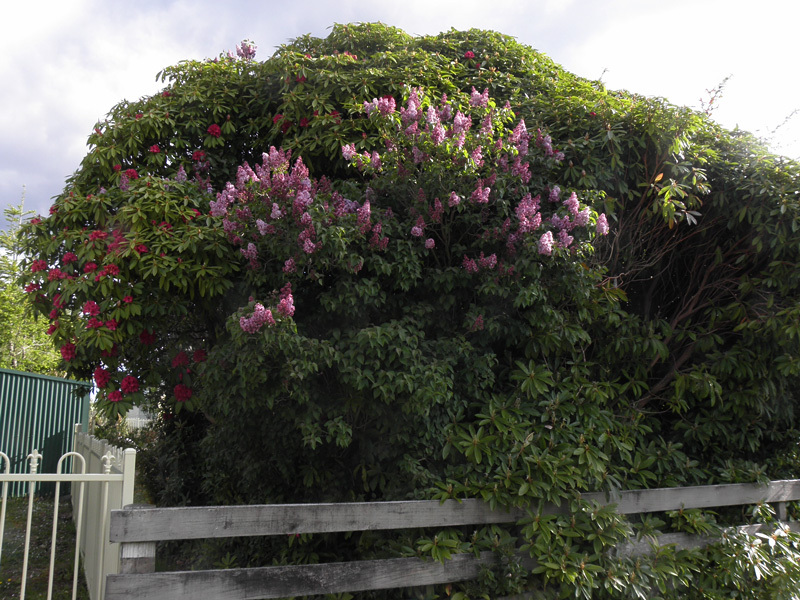 Somehow strange, but nice to find flowering lilacbushes here and there in the village as well as singing Dunnocks, Chaffinchs, Blackbids and Starlings. The latter had newly hatched nestlings. 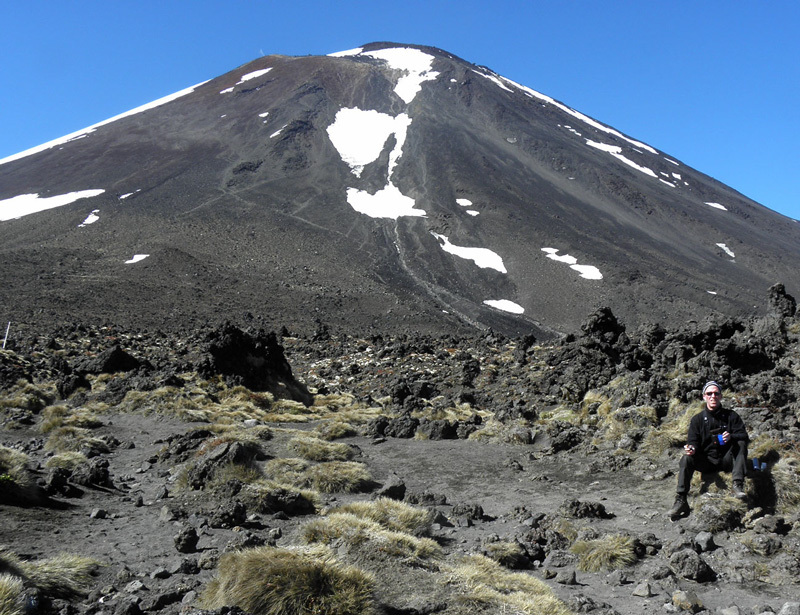 ....which faced an awesome scenary like Mount Ruapehu. 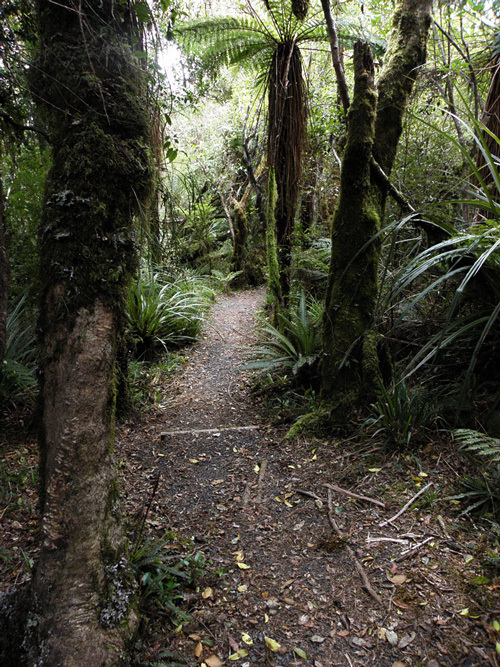 On my first day (the whole evening of 9th) I had a long walk through the old forest on Fishermans Track. 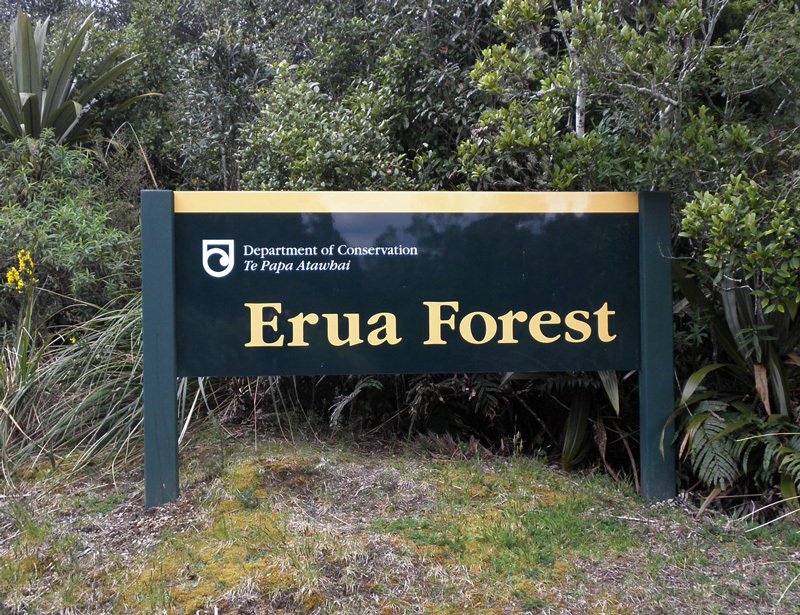 Here I saw my first NZ passerines such as Tui, Fantail, Whitehead, Grey Warbler, Bellbird and Tomtit. Walking through the old forest were refreshing for your mind! The narrow gravel tracks were all well done and easy to walk. 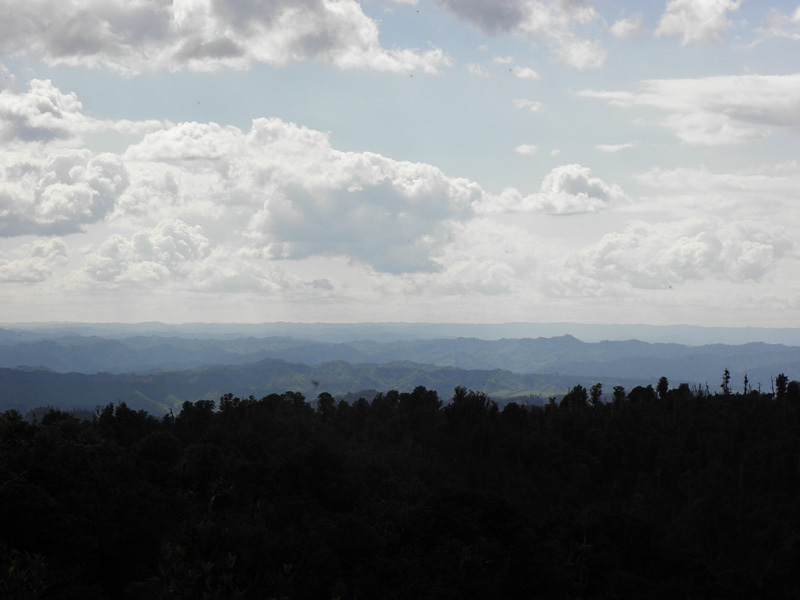 Amazing view from Tupapakurua Falls. 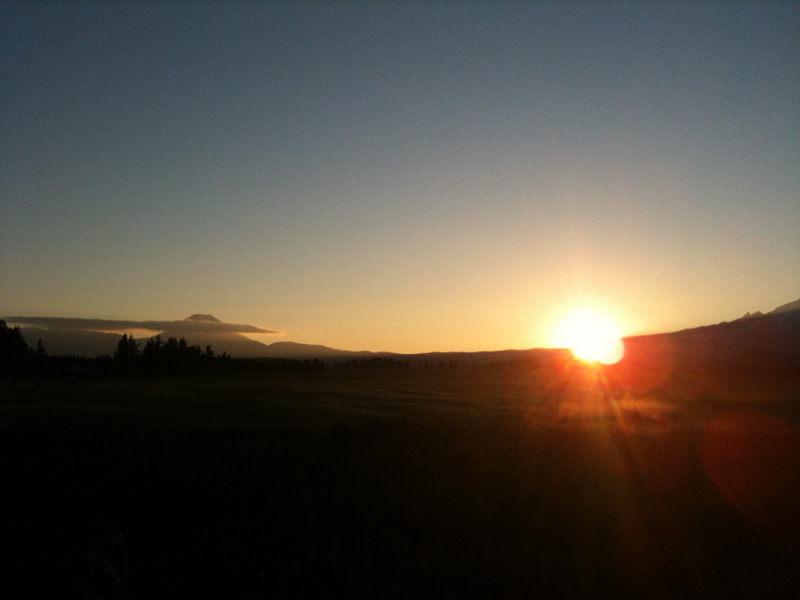 Sunrise at Tongariro on 10th. 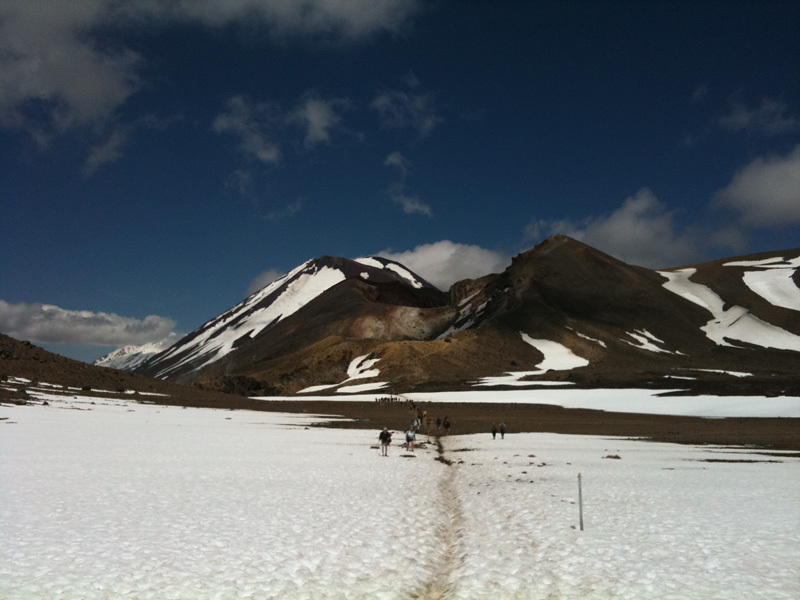 Clear blus sky and a perfect day for the Tongariro Alpine Crossing. Lucky me as it was the only day I had for it. The walk takes about 7-8 hours in moderate speed. 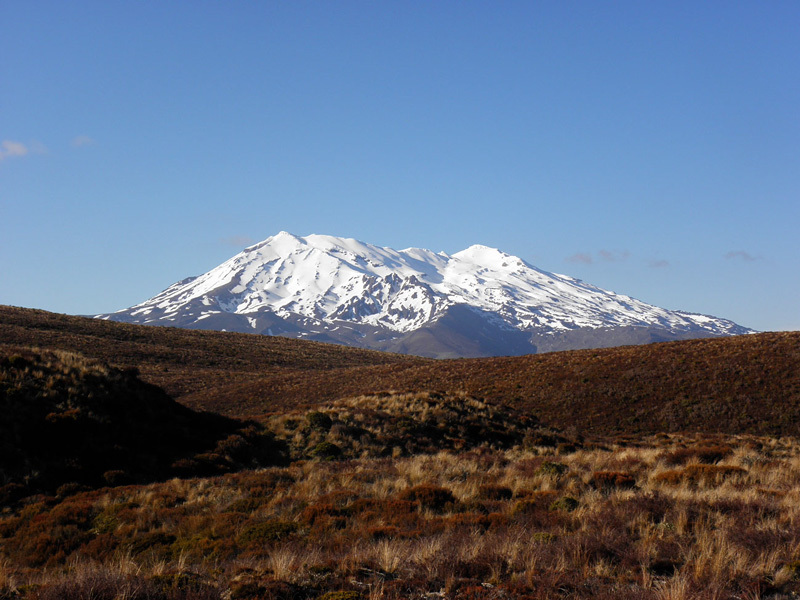 Mount Ruapehu (2,797 metres above sea level). 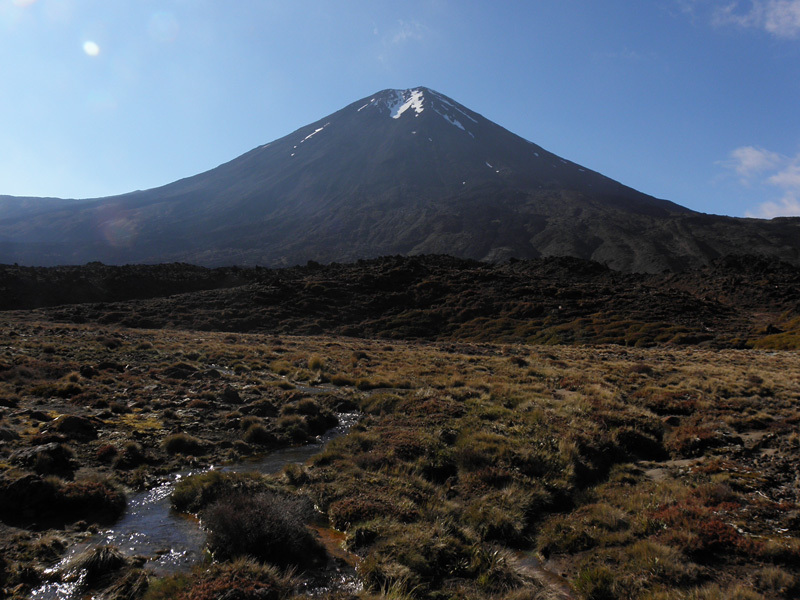 Mount Ngauruhoe. Lot of small streams here and there. 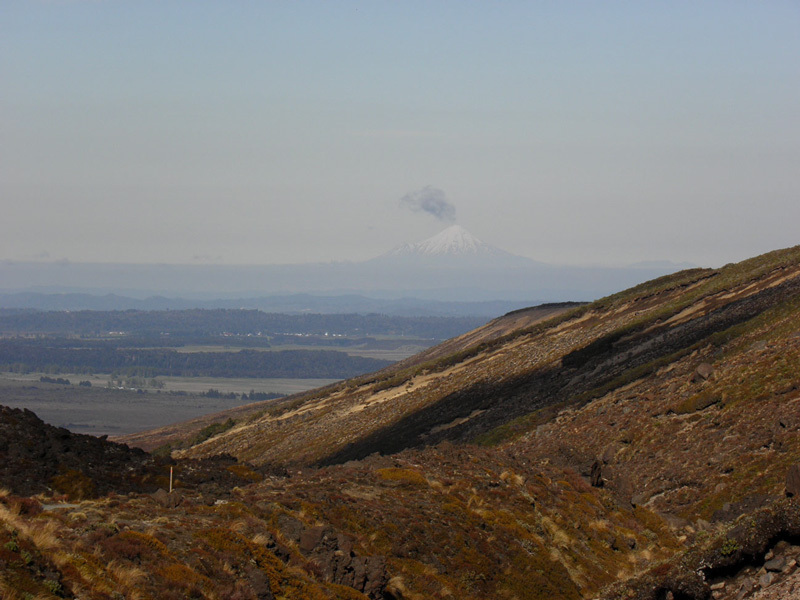 View towards west and Mount Taranaki in far background, which is an active but quiescent stratovolcano on the west coast. 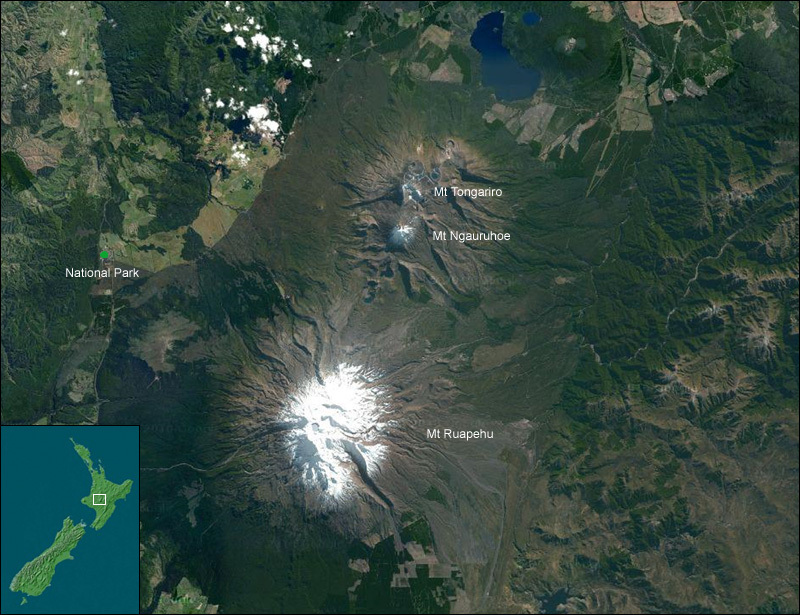 The 2518 metre high mountain is one of the most symmetrical volcanic cones in the world. 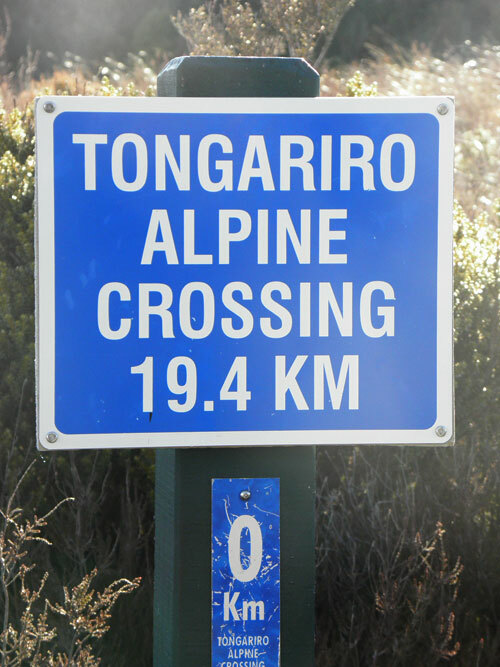 The Maori word tara means mountain peak. 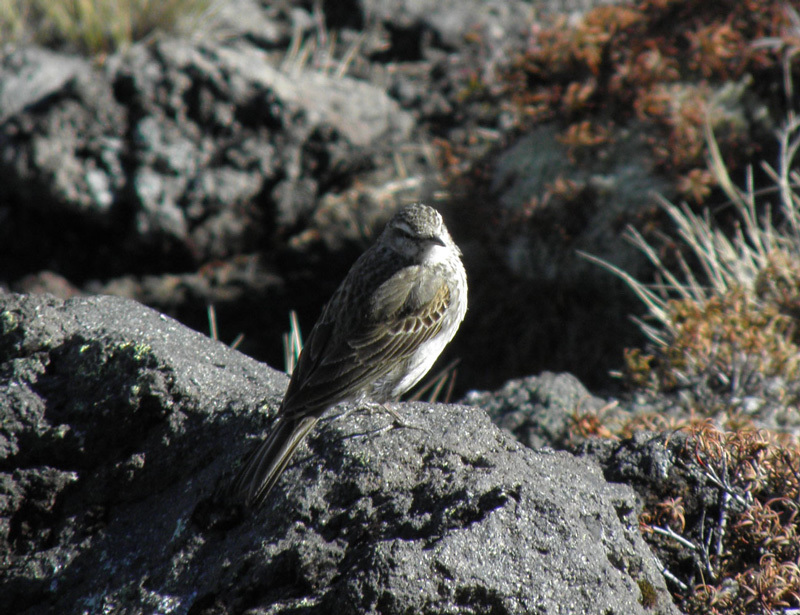 New Zeakand Pipit, were the only species to be seen during the crossing. 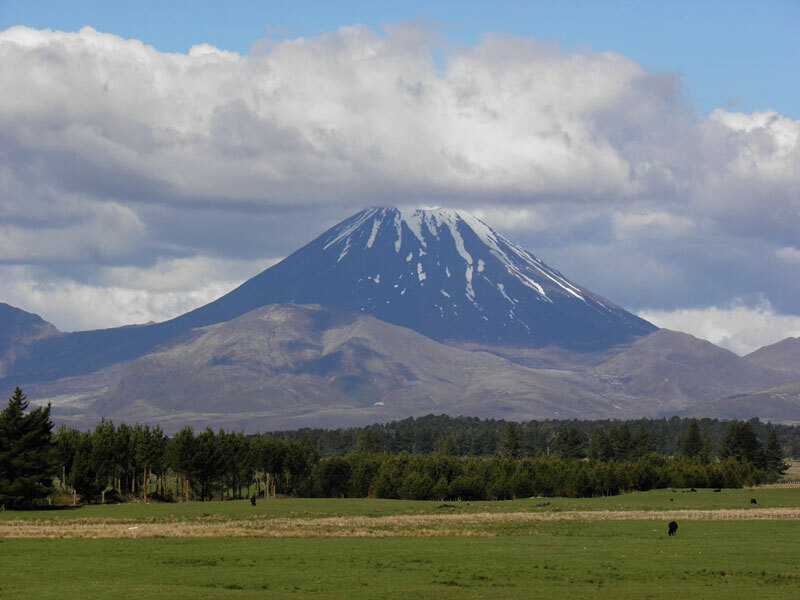 As a matter of fact Mount Ngauruhoe was used as a stand-in for the fictional Mount Doom in The Lord of the Rings movie trilogy. And everyone knows that Sauron has left the building, the ring was destroyed, Mount Doom is asleep and no orch has been seen ever since. So, I felt pretty safe while enjoying a coffee break. 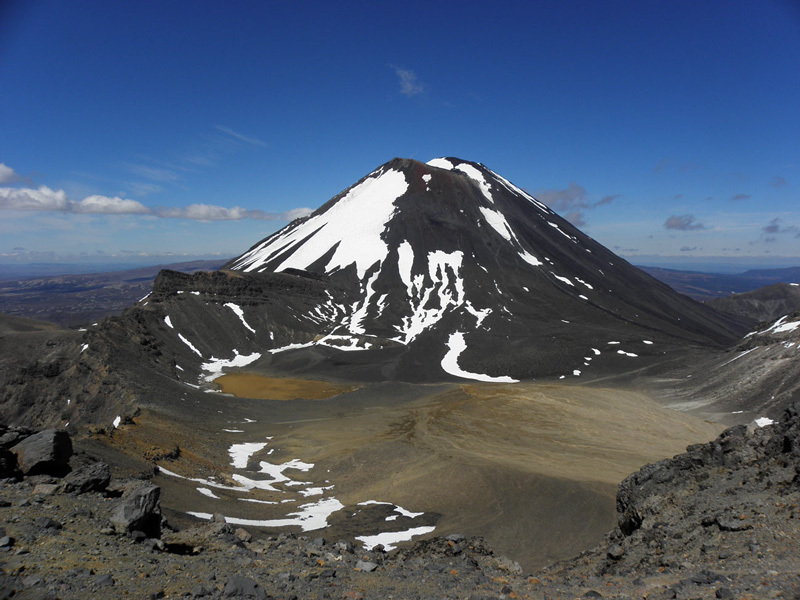 View of Mount Ngauruhoe (2,291 metres above sea level) ) from Mount Tongariro (1,967 metres). 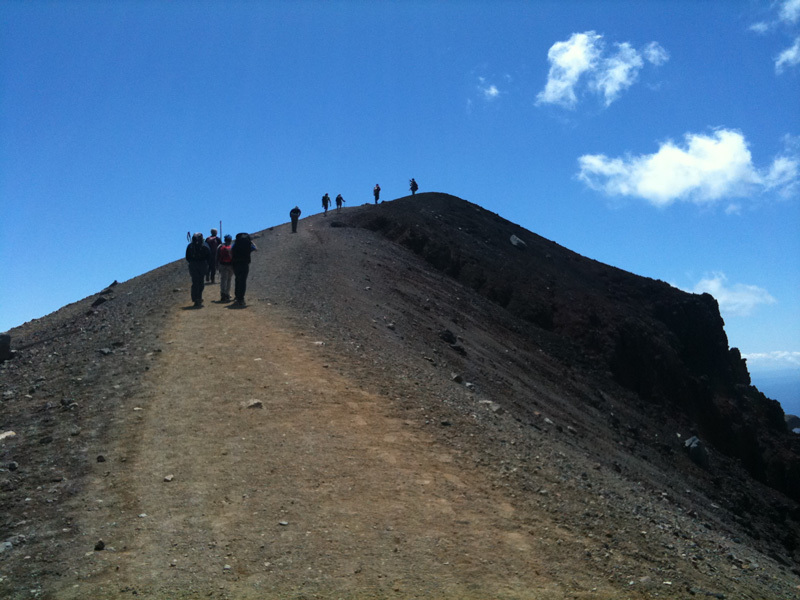 Trekkers on the Mount Tongariro ridge. A quite difficult walk downwards to the Emerald Lakes (Blue Lake in background). The Emerald Lakes. The brilliant green colour of the water in these lakes, caused by minerals leached from the surrounding rock. 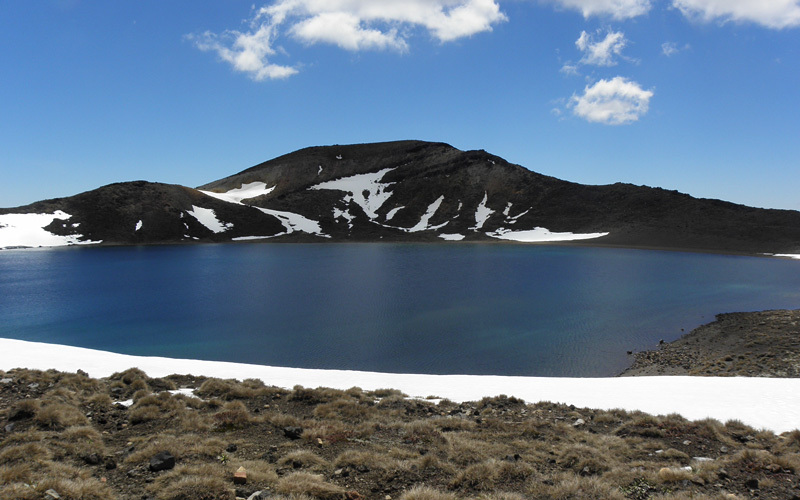 The track sidles around the edge of Central Crater through snow and then climbs up to Blue Lake. The Blue Lake. 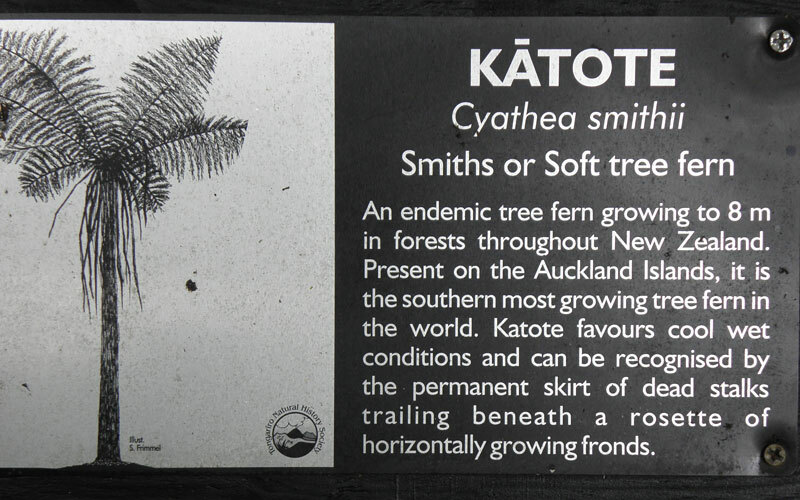 The Maori name translates as Rangihiroas mirro. 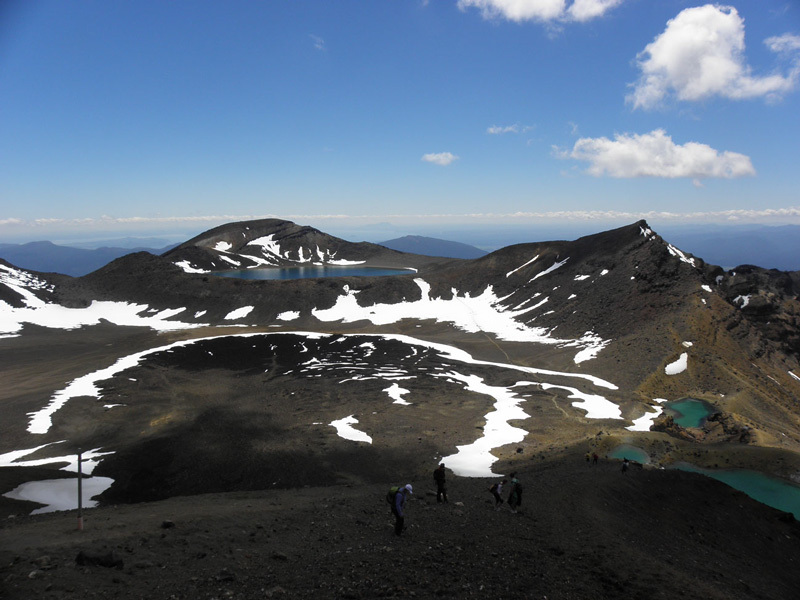 Rangihiroa, the son of the local chief, was said to have explored the Tongariro volcanoes in the middle of the 18th centrury. 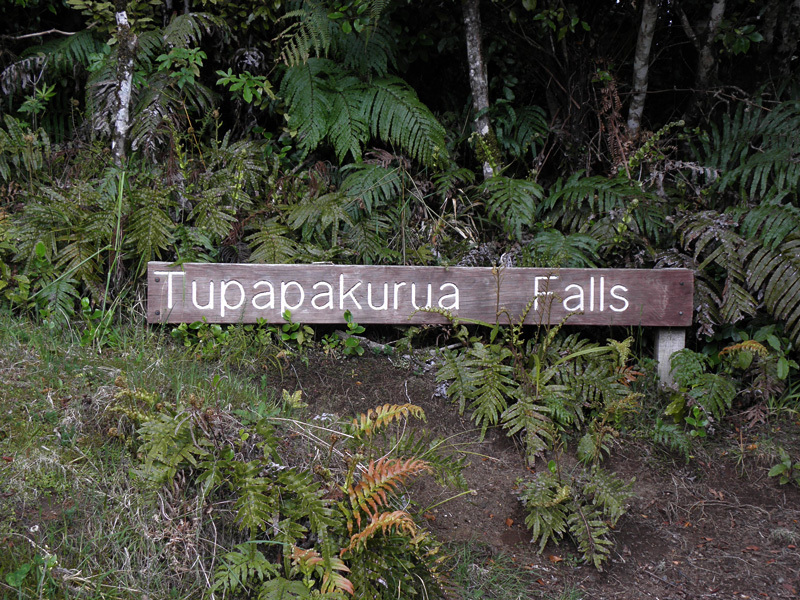 The lake is tapu (sacred) and it is disrespectful to eat or drink around its shores. 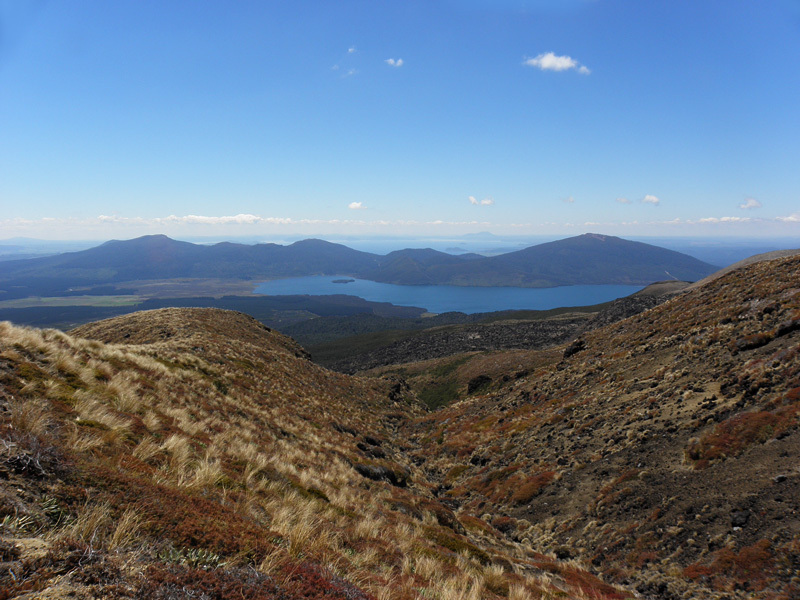 View towards Lake Rotoaira to Lake Taupo. 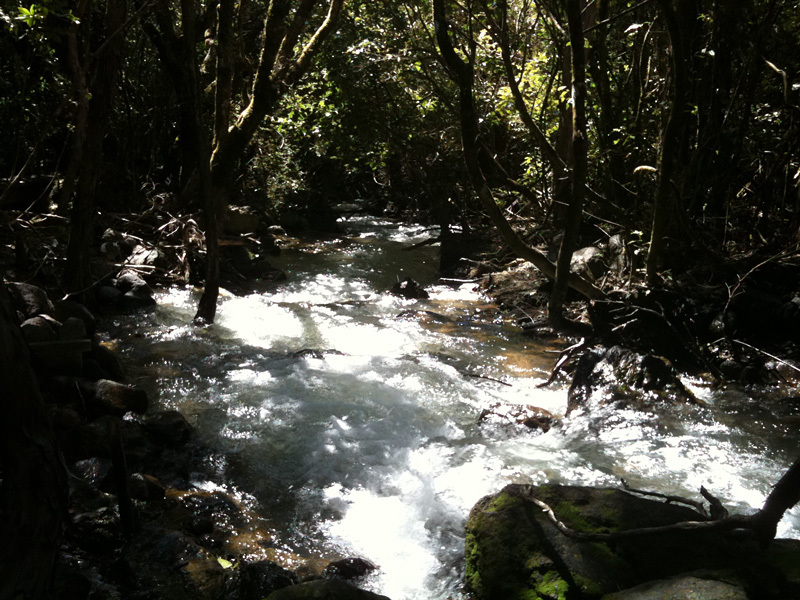 Lovely forest along the Mangatetipua stream of the last kilometres. 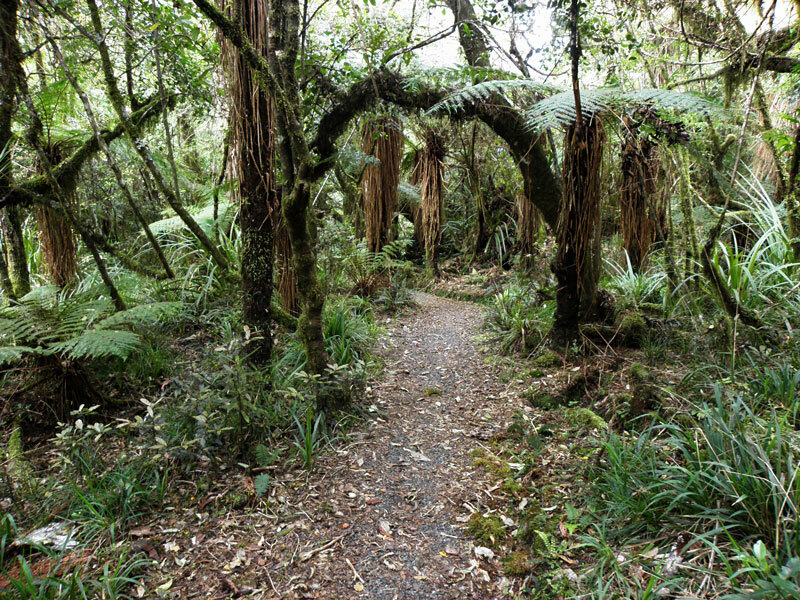 In the woodland I noted lot of Tuis, Grey Warblers, Bellbirds and Tomtits. 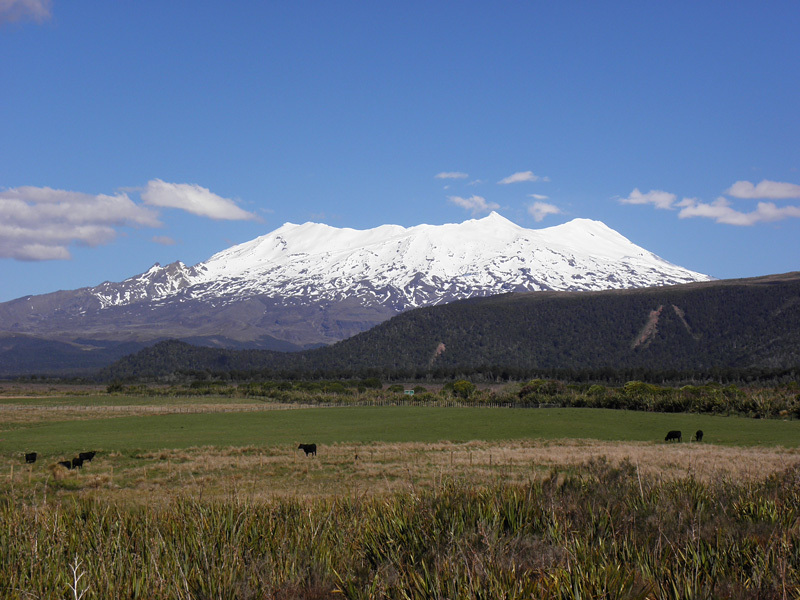 Mount Ngauruhoe in the evening of 10th, sviewed from the National Park village. 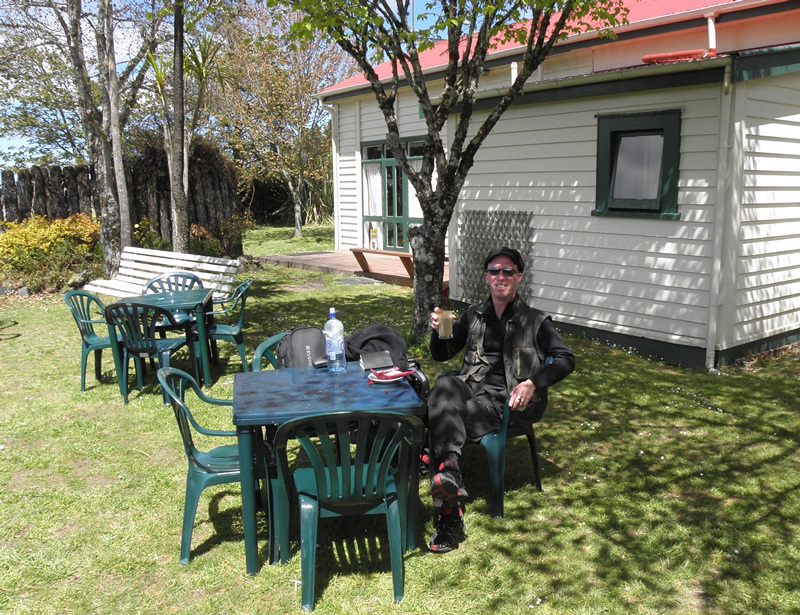 A last latte in the restaurant garden of the train station, before heading to Wellington on 11th November.